Ideal for extending an existing IEC mains lead, just plug the IEC extension lead onto your existing IEC power cable to make it 1m longer. 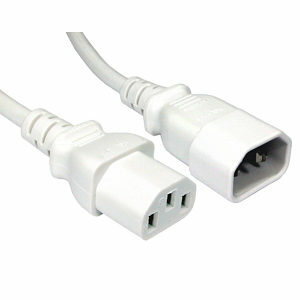 3m White Angled Figure 8 Power Lead - Power Cable, UK 3 pin plug to figure 8 connector. Voltage rating 240V AC. Cable type, 2 Core 0.75mm 90 degree angled fig 8 C7 connector. Colour White 3A Fused Length 3m.